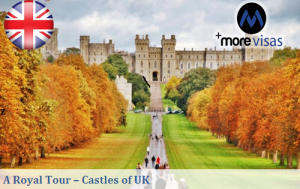 This entry was posted in Migrate to UK and tagged Travel to UK visit visa of UK visiting UK on June 14, 2016 by Blog Author. When I say royalty, the only thing that comes to my mind is Britain. The land of rich history, the greatest empire that ever existed, one of the few monarchies left in this world, this is the home of breathtaking castles. I have always wanted to live in a castle, have you? I have picked out 5 of the most splendid castles so come on and let us take a tour. This 900 years old official home of the royal family is the famous Windsor Castle. Apart from the royal palace, on the castles grounds are several homes and a large church. It is also the weekend home of Queen Elizabeth II. Located 32 kilometers west of London, the castle has more than a million visitors each year. The Edinburgh Castle in Edinburgh has survived through invasions, power struggles and siege. The castle is in custody of the Scottish crown jewels – 500-year-old crown, sword and scepter used coronate the Scotland’s monarchs. The castle has dungeons where prisoners were executed. The One O’Clock Gun would fire precisely at 1:00 p.m. every day except on Sundays, Good Friday and Christmas, since 1861 for locals and sailors to signal the right time. Leeds Castle was the home of Henry the VIII situated about 50 kilometers from central London. Leeds Castle has many American connections including two families who previously owned the castle also possessed land in Culpepper and Fairfax, VA and quite many movies were shot here as well. Tintagel Castle is located in Cornwall, England built 800 years ago. The Earl of Cornwall was fascinated by the legends of King Arthur and his Knights of the Round Table and designed this castle to resemble his court. Warwick Castle in Warwick is known for the medieval re-enactments and its splendid interior. Generations of Earls of Warwick resided in the castle until 25 years ago. Warwick was built around 900 years ago as well. For over 1,000 years, the Tower of London has been the home of the royal family and crown jewels. It was opened for public viewing for the last 350 years and nearly 2 million people visit the tower each year. In order to travel to UK you need a Standard Visitor Visa which permits entry for 6 months. You require a valid passport, a return ticket, proof of funds and accommodation details.